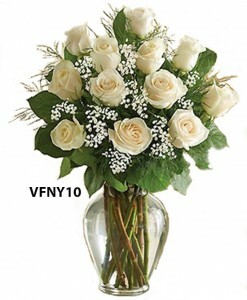 VFNY10 - This classic dozen white roses will be sure to convey the warmth in your heart. 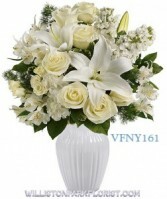 VFNY10; Vogue's Classic Dozen white Roses artfully arranged in a clear vase with a matching ribbon. Suitable for any occasions. 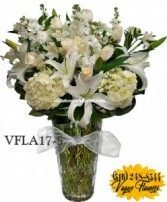 This arrangement can be upgraded to 18 Stems of White Roses 122.95; 24 Stems of White Roses 149.95. Call us today or order online 24/7 Vogue Flowers in Williston Park, NY and we'll be glad to assist you. VFNY3-Lavish and Grand, this centerpiece will be the showcase of your celebration.